Bushnell E3950B Elite 3-9x50 DOA 600 Reticle Riflescope E3950B FREE SHIPPING! 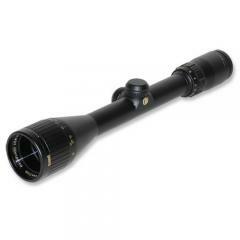 The Bushnell Elite E3950B is an advanced, variable power riflescope built for deadly accuracy. It features precision-engineered optics treated with an Ultra Wide Band Coating that maximizes light transmission across a wide portion of the visual spectrum, enhancing brightness in low-light conditions. The bright, clear image allows you to pick out distant targets with ease, and its click adjustable windage and elevation controls make it easy to place your shot exactly where you want it. Advanced Rainguard HD coatings on the external lens surfaces break up water droplets into microscopic particles, reducing light scattering to maintain visibility in wet environments. The one-piece tube is argon-filled to keep out water and prevent fogging, and also tested for superior recoil resistance. ©2002-2019 CopsPlus.com: Bushnell E3950B Elite 3-9x50 DOA 600 Reticle Riflescope E3950B FREE SHIPPING!